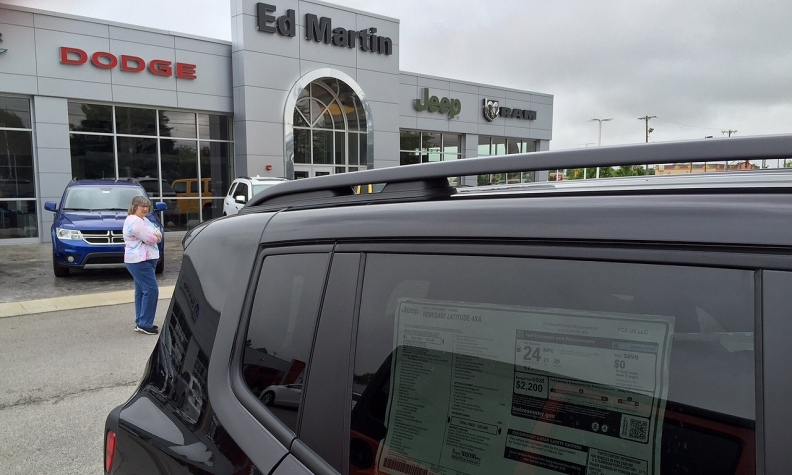 Lurking behind those solid second-quarter earnings results from five publicly traded dealership groups last week was a disturbing trend: Profit margins on new-vehicle sales fell at all five companies. "There is something occurring there, whether it's great competition or other factors," said Lithia Motors Inc. CEO Bryan DeBoer. Still others said there was a drive for volume over margins, and they defended that trade-off. DeBoer: Volume drive "worth the sacrifice in margin." DeBoer said: "We still believe if you can continue to drive top-line volume in vehicles, it's worth the sacrifice in margin because volume drives service revenue and back-end gains." Revenue and profits generally rose, powered by higher new and used volumes and strong earnings in fixed operations and finance and insurance. On a same-store basis, Lithia's new-vehicle retail sales rose 5.7 percent, topping the 3.3 percent rise in U.S. light-vehicle sales in the quarter, but the average gross profit per vehicle retailed slid 5.6 percent to $2,124. DeBoer said some automakers' incentive programs prompted some Lithia stores to ease back on pricing to hit sales targets and win added incentive money. AutoNation Inc., Asbury Automotive Group and Group 1 Automotive Inc. all posted higher new-vehicle sales but lower per-vehicle gross profit on those sales. They attributed that margin pressure to shifting consumer demands. "We're very heavy with Toyota, Honda, Nissan. They're more car brands than truck brands," Group 1 CEO Earl Hesterberg said in a conference call. With the supply of cars outstripping demand, he added, "Everybody's pushing us. I don't think anybody likes it, but you either sell the car or you don't." Added Group 1 CFO John Rickel: "With F&I as lucrative as it is, you don't want to miss that opportunity with the sale." At Group 1, F&I gross profit per new vehicle retailed in the U.S. rose 6.4 percent to $1,535. At AutoNation, "Our most stressed segment is midsize cars because of the drop in gas prices. There's also been a shift in customer demand," CEO Mike Jackson told Automotive News. "We're feeling the most pressure with Nissan." On a same-store basis, gross profit per new vehicle retailed slipped 5.3 percent at AutoNation to $1,905, fell 10 percent at Asbury to $1,865 and dropped 12 percent at Group 1's U.S. stores to $1,551. "It's become a much more competitive environment," Asbury CEO Craig Monaghan told Automotive News. "We've seen pressure in the midline import market. We attribute some of that to gas prices causing pressure on that market." Monaghan also said Asbury has experienced some pressure in the luxury market, which he attributes to shifting customer demands. At Sonic Automotive, gross profit per new vehicle sold fell 9.1 percent to $1,925. The bulk of that $192 decline was from sales of Honda, Toyota and BMW vehicles, President Scott Smith told Automotive News. BMW accounts for 30 percent of Sonic's profits, he said. Toyota and Honda brands are a close second to BMW so, "if we do anything with those brands, it's going to affect our numbers," Smith said. "Our total gross is up, but the average per unit is down. That's driven by volume. It's kind of the idea half a loaf is better than no loaf," Smith said. "You're selling a car at a lower rate, but maybe your F&I and service goes up. So instead of selling one car at a $5,000 profit, you're selling two cars at a $3,000 profit."